Even on cool days, our greenhouse is warm and humid and full of blooming plants! Unfortunately, they are blossoming much too soon to be enjoyed by our FloraKansas shoppers. I have been fastidiously clipping those flowers off in hopes it will boost leaf growth. With all these cut flowers at my disposal, I have been making floral arrangements for all my friends and family. You don’t have to be an artist or a professional florist to make gorgeous, natural looking arrangements with natives. You just have to know what plants to use and a few basic design principles. Every grandma loves to get some unexpected flowers! On my first cutting of early greenhouse flowers I found some ‘Violet and White’ columbine, ‘Lynnhaven Carpet’ daisy fleabane and ‘Gold and Bronze’ coreopsis. 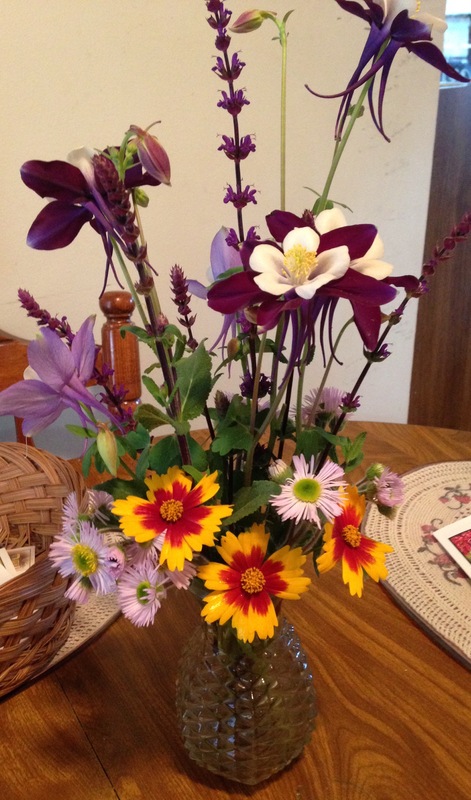 I combined those flowers into a small, columnar arrangement and gave it to my grandma as a surprise. To create fast, no-fuss arrangements on the fly I follow a few simple design principles. This leaves lots to learn, but if you start with these rules you are sure to get fast, eye-catching results. 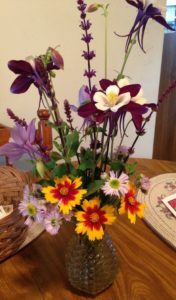 Serendipitously, this fist cutting was the perfect combination of colors — dark purple columbine, light lilac columbine and daisy fleabane, along with yellow coreopsis, provided that pop of interest that only complementary colors can do so well. 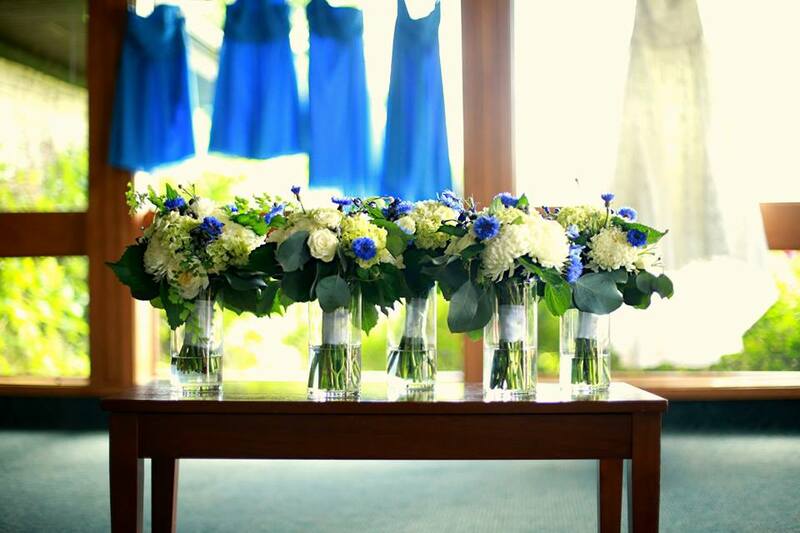 I have had the opportunity to do floral design for many of my close friends’ weddings. Some of them specifically requested the use of native plants, others wanted a touch of native, but mostly traditional choices. I am always amazed at how many beautiful stems, blooms and greenery I can find locally. I pluck these from my yard and the landscapes of friends and family as well as roadsides and pastures (always being careful not to trespass or over-harvest, depleting the future seed bank). By using what is on hand, I am avoiding the costly fresh-cut flower industry and the huge carbon footprint that goes into it. Here are a few examples, in order from ‘least native’ to ‘most native’ material used in the composition. A friend of mine requested only green and white in her bridal bouquet, and wanted something very small and unassuming. 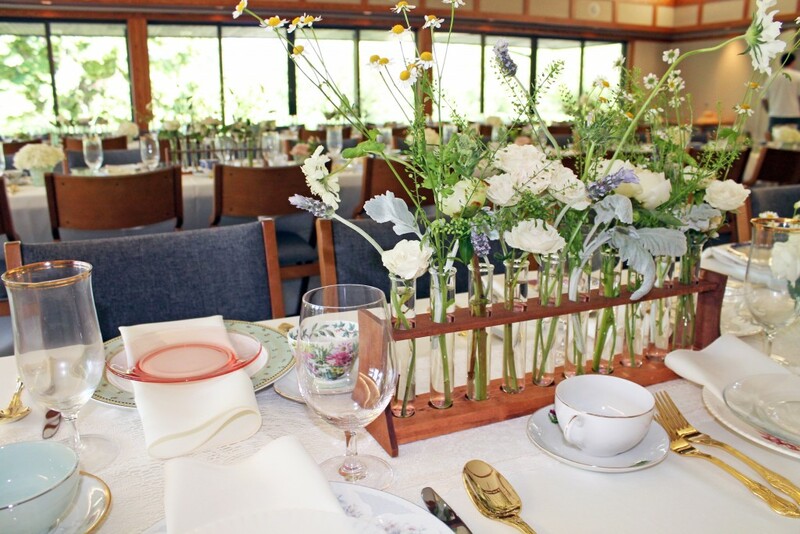 I choose store-bought hydrangea blooms and baby’s breath, with varying shades/shapes of greens to keep it interesting – grey, stiff eucalyptus leaves, bright green huckleberry and fresh cut white pine tips, the only locally sourced element seen here. 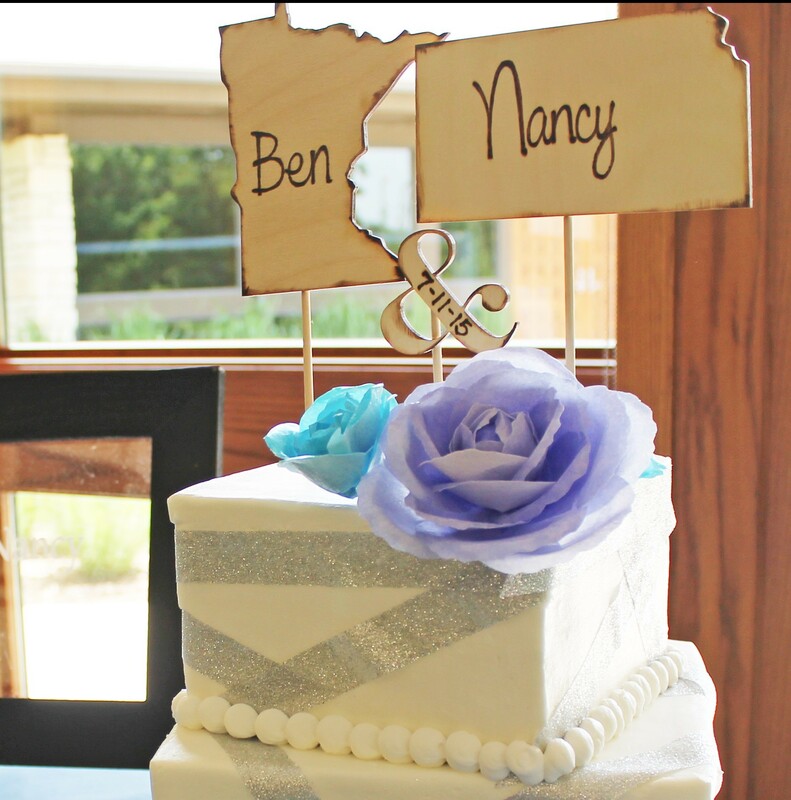 The huge round hydrangea was the centerpiece of the bouquet, so I used tall elements to create a fan effect. This is a bridal bouquet I did for a church wedding. 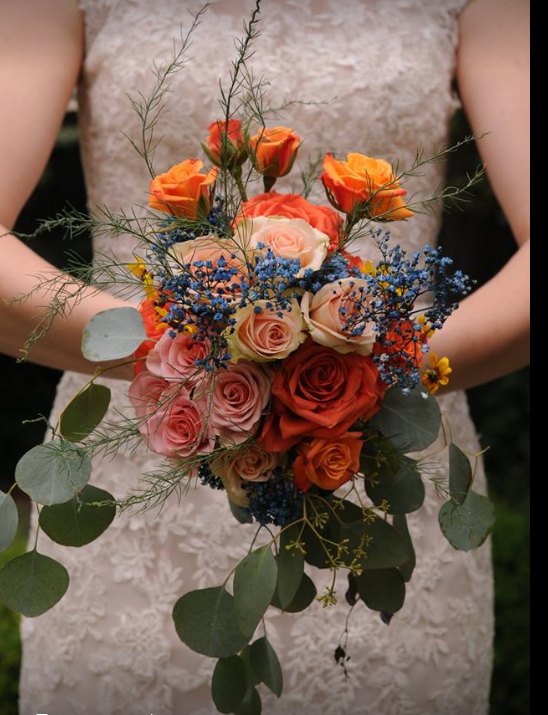 The bride specifically requested something rounded and traditional, but also incorporating her wedding colors (peach and navy blue). 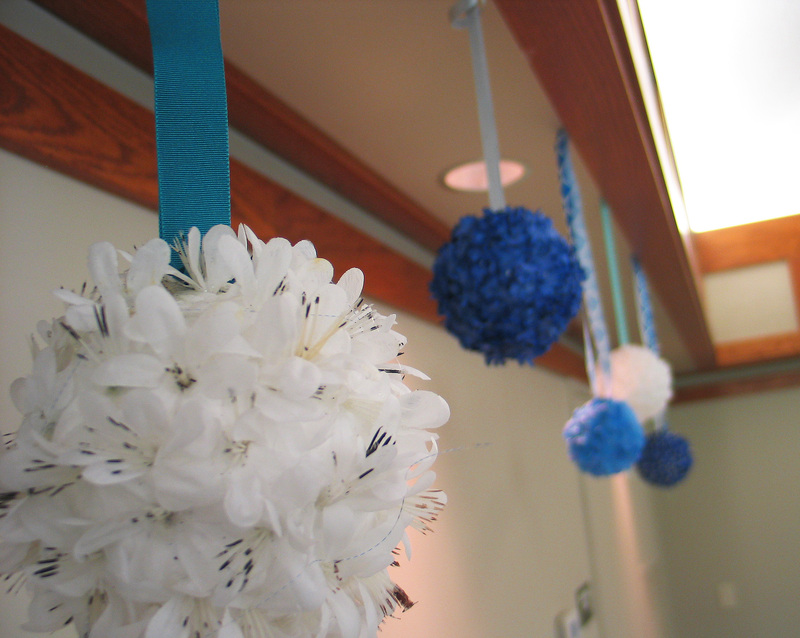 I purchased roses, eucalyptus leaves and baby’s breath (which I used floral spray paint to turn blue). In the road side I found dainty yellow blooms of native Coreopsis tinctoria, a perfect complementary splash against blues and greens. I also added some asparagus greenery from an old patch in my parent’s yard – airy and light, it adds nice movement and more green tones without bulking up the bouquet. 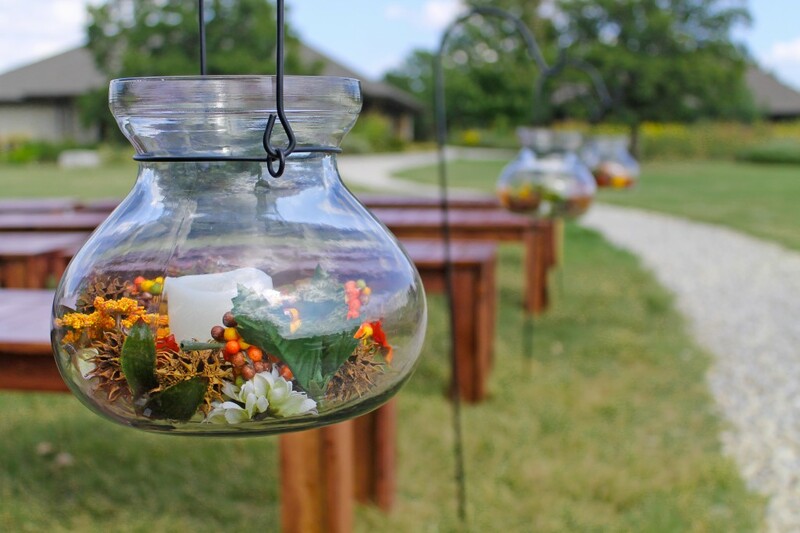 In Kansas, summer and fall are great times to get married if you want to incorporate native elements. 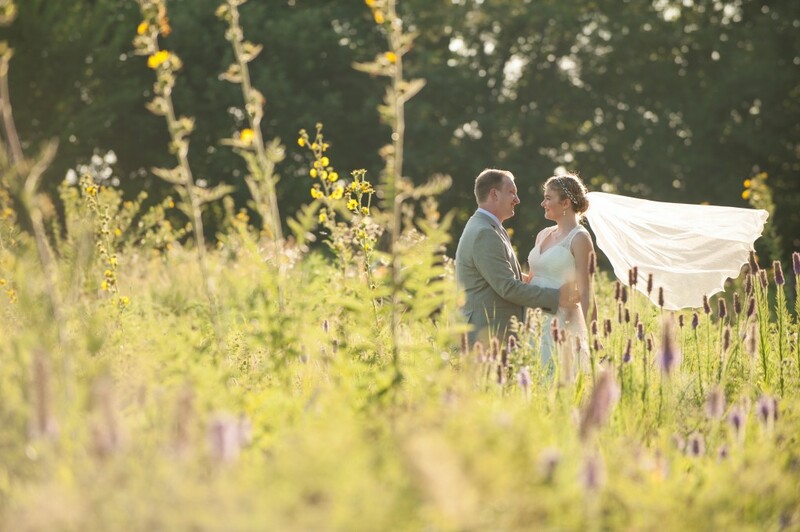 This particular bride and groom requested wheat heads and lavender as must-haves, along with lots of yellow wildflowers. I bought light pink roses and baby’s breath, but everything else I found in the gardens of their family and friends, making the flowers just that much more meaningful. The Echinacea purpurea, Rudbeckia fulgida and Achillea ‘Sunny Seduction’ were from the grandparents of the groom, as well as the massive white hydrangeas I used at the base for filler. 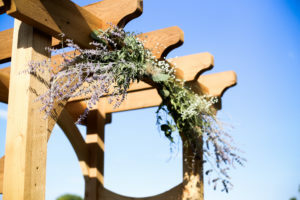 I created an alter decoration for that wedding, using fresh Russian sage (Perovskia) from the mother-of-the-bride’s garden and leftover baby’s breath. It smelled amazing and kept its shape even in the drying sun. Boutineers are a tedious task, but oh so cute! 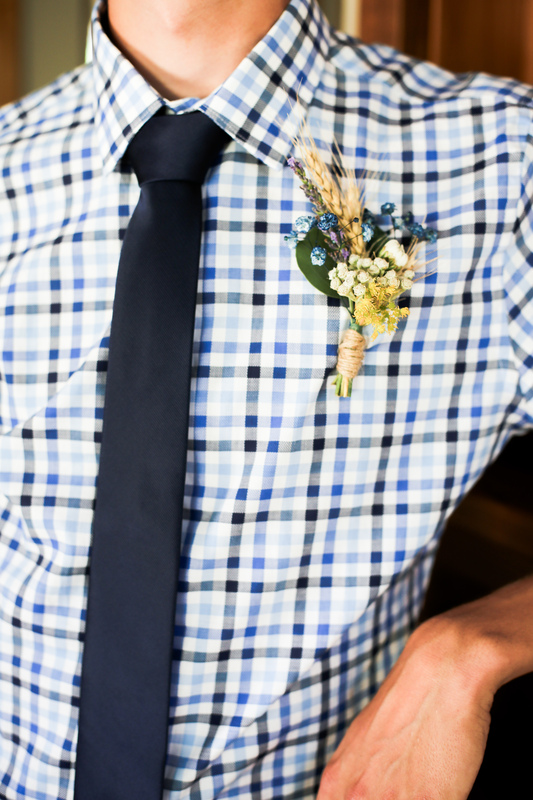 I created an easily reproducible teardrop shape boutineer for the groom, with wheat as a vertical element. 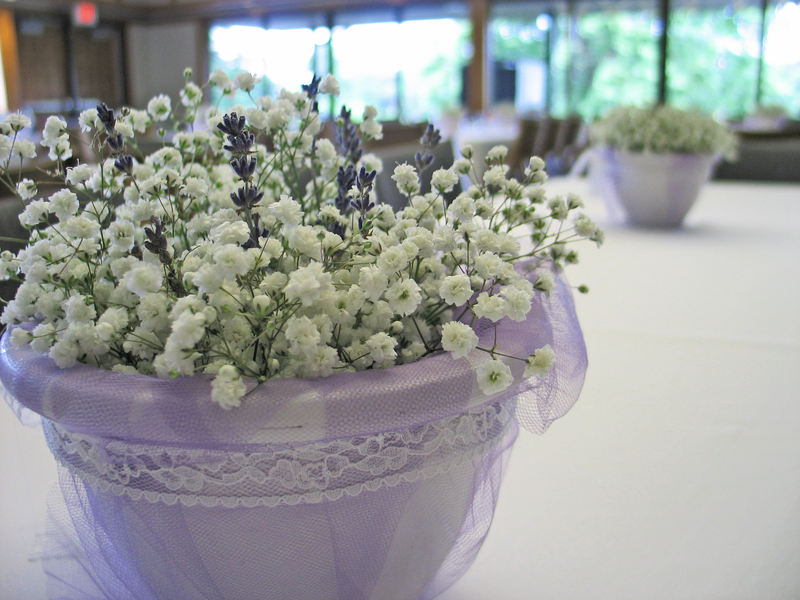 To match the bride’s bouquet, I included tiny cuttings of yarrow, lavender and baby’s breath. Knowing that boutineers will need to keep their vigor without water for many hours, flower choice is key – native wild quinine (Parthenium integrifolium) is a white, stiff pearl shaped flower that mimicked the look and shape of the bride’s hydrangeas perfectly, which would have quickly wilted if used in a boutineer. Don’t think the flower power has to end when the growing season does – with strong stems and seed-holding blooms, native plants are excellent specimens for dried arrangements. Grasses such as Pancium provide airy but firm filler to work around, and the black, bulbous seed pods of Baptisia australis add interest. 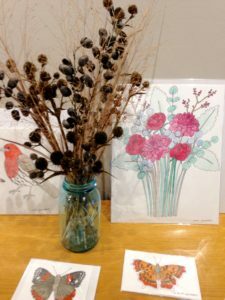 This arrangement is complementing the artwork of Leah Gaddert, available for purchase at the Arboretum Visitor Center. The round seed heads of Eryngium yuccifolium and Echinacea species contrast well with the upright nature of Liatris pycnostachya. Chasmanthium grass (far left in vase), also known as fish-on-a-string, provides a whimsical note. The best way to always have gorgeous arrangements is to have a great garden to cut them from. By planting native you can feed wildlife and pollinators, as well as your eye for design. Using natives and adaptables in your floral designs is cost effective, has a low-carbon impact and offers new options in every season. Come to the FloraKansas Native Plant Festival and pick up some native plants to get started on your own floral art! 1. Reduce consumption of disposable goods. 2. Repurpose found items for decorations. 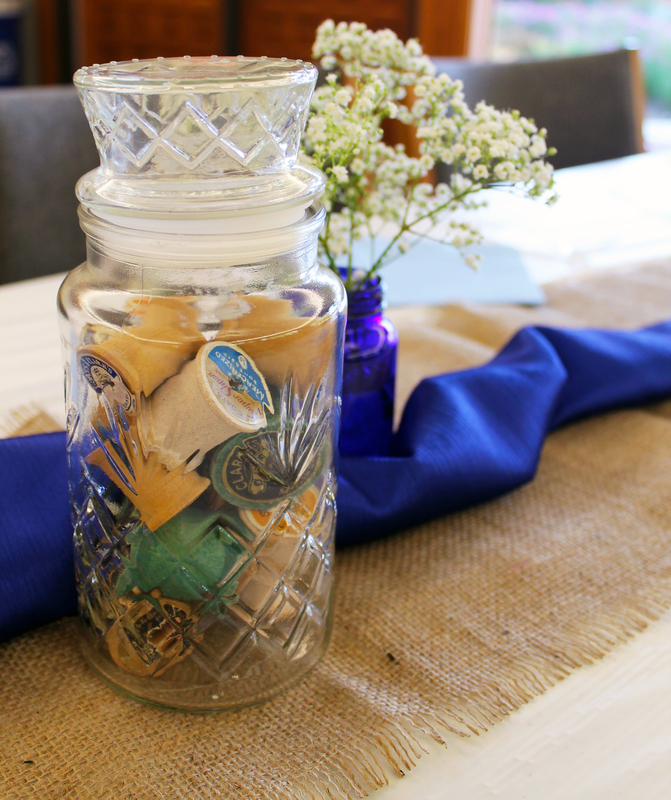 In September, Anna and Justin used a very creative selection of items from home on their tablescapes, including various jars, tins, spools of thread, old medicine bottles and vases. These, combined with burlap and a bright cobalt blue piece of fabric for a table runner, tied everything together very nicely. 3. Use alternatives to hot house flowers. 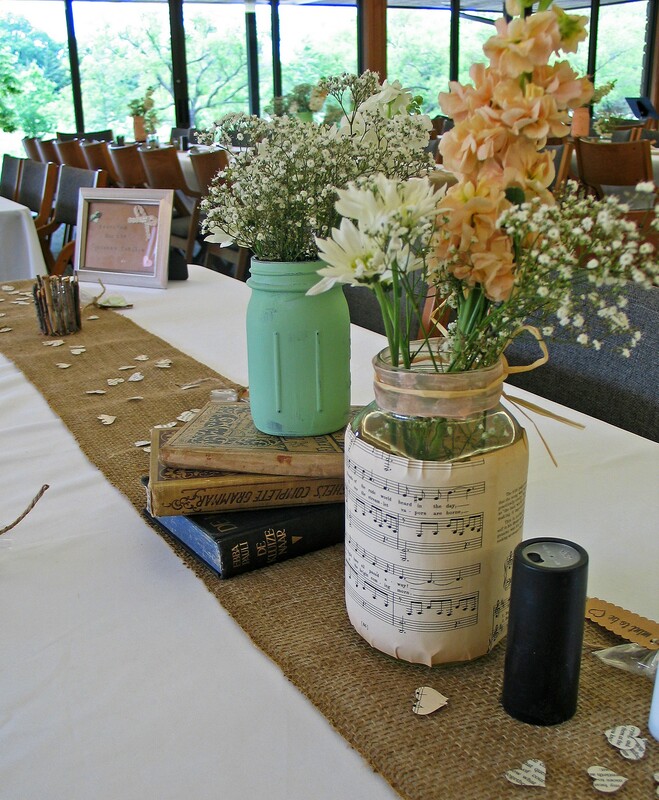 If you have several guests or members of the wedding party coming early to help out, put them to work the day before the wedding and have a flower-picking party! Abi and David did this in August and the results were simple, but stunning. Do some research to find out what wildflowers typically bloom in the roadsides or in your friends’ gardens during the month of your wedding (or visit our Pinterest boards to see what blooms here) and plan your color scheme accordingly. Be flexible and open to using what you can find – and be sure to ask permission before you pick! 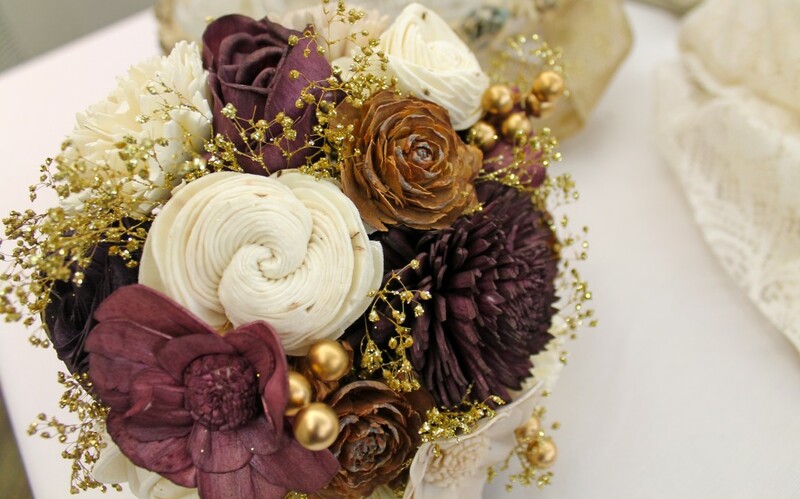 Also, consider using fabric and/or wooden flowers, like Leah did this past October. If you want to keep your bouquet, this is a great way to ensure that your “roses” will be as good as new at your 25th anniversary! Several of the weddings held here this year had fewer than fifty guests attending and many more had fewer than one hundred guests. In my experience, these are some of the most joy-filled celebrations we’ve had here at the Arboretum. 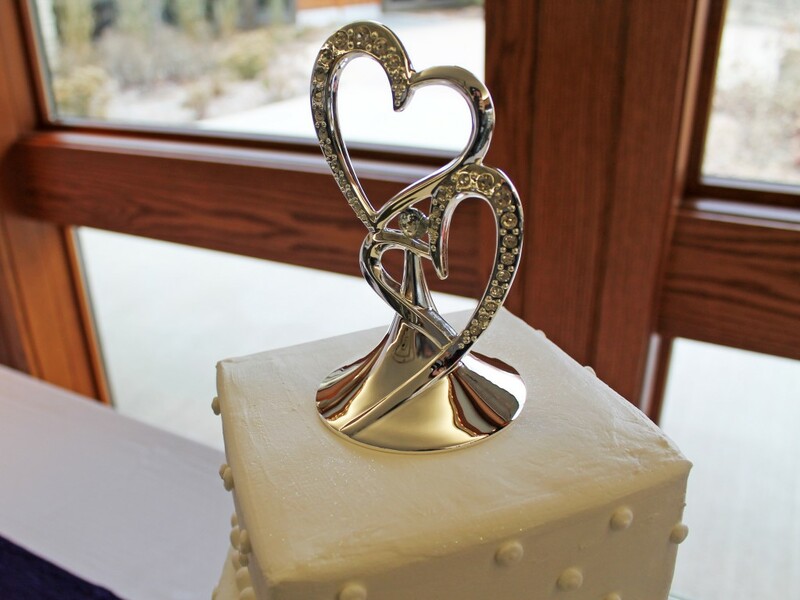 One traditional element of a wedding ceremony is the lighting of a unity candle. 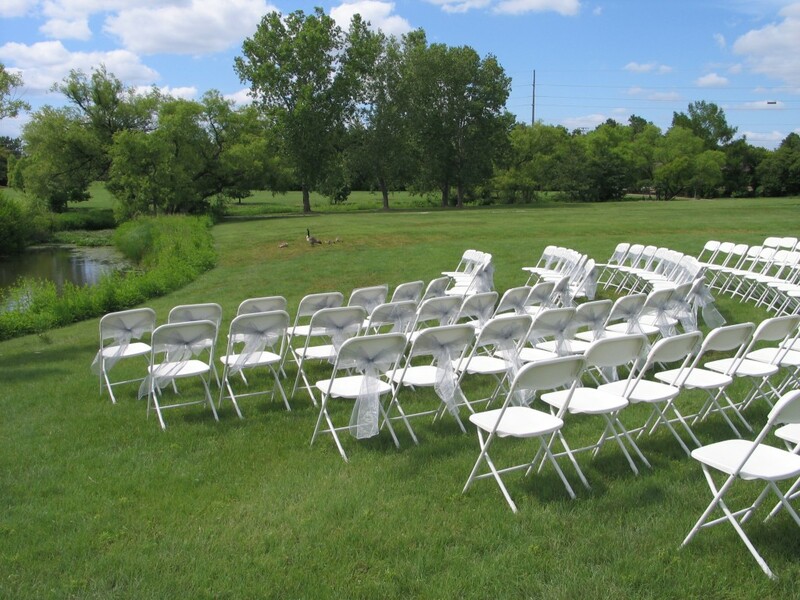 With our Kansas winds, this can often prove challenging for an outdoor wedding. Often, we like to suggest a “unity plant” as an alternative. 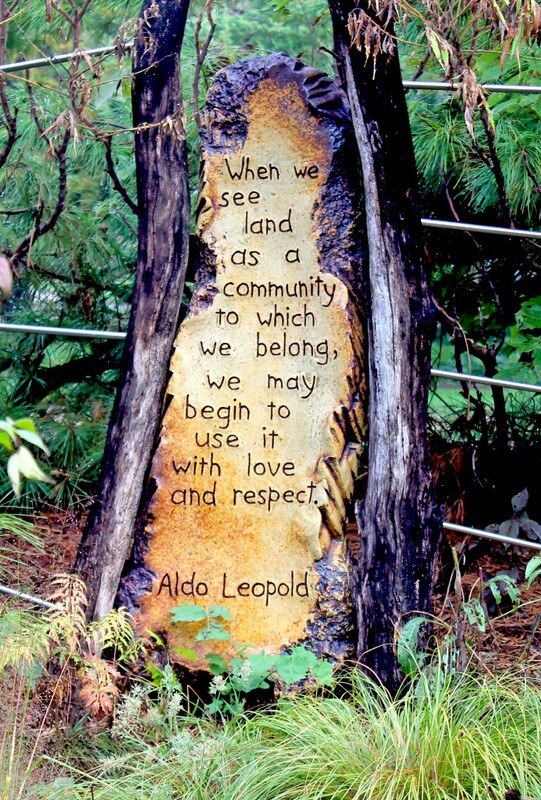 It fits with the mission of the arboretum, and after you add water and soil to your plant during your ceremony, you can either take it to your new home and plant it there, or – if you aren’t settled yet – you may donate it back to the arboretum and we will plant it here on our grounds. 6. Support a venue with a mission you can believe in. 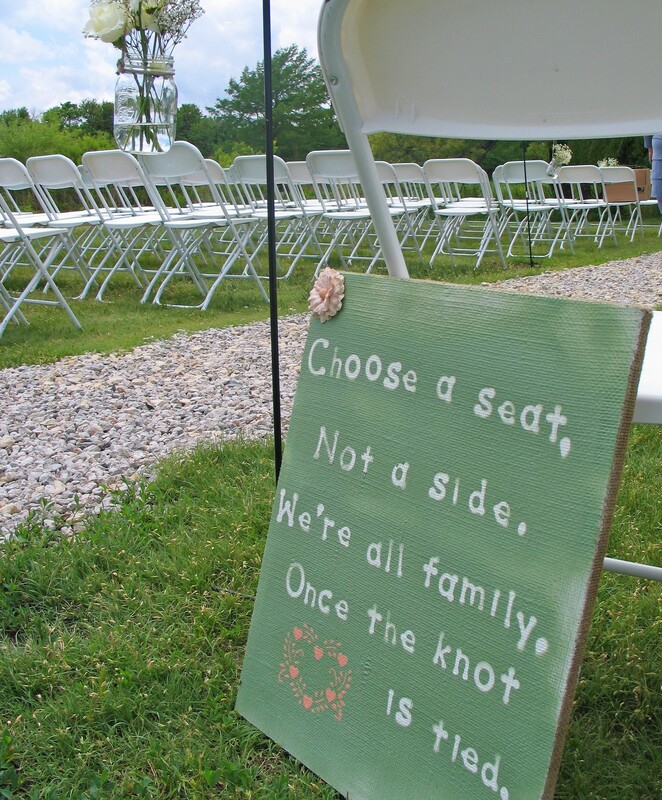 Choosing a venue is one of the first and most important decisions in the wedding planning process. It is also one of the best opportunities to make a positive impact with your eco-friendly wedding. 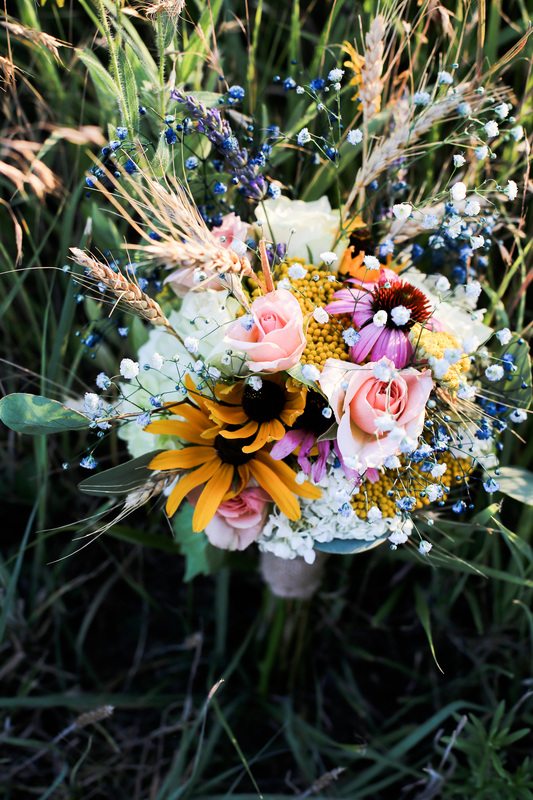 There are so many unexpected venue choices to consider, such as a national park in your area, or a local farm operation, or a small, non-profit, prairie garden. 😉 Do you see where I’m going with this? When you choose a venue both for its beauty and for its broader ecological purpose, you aren’t just paying for a rental space, you are supporting the mission of that organization. 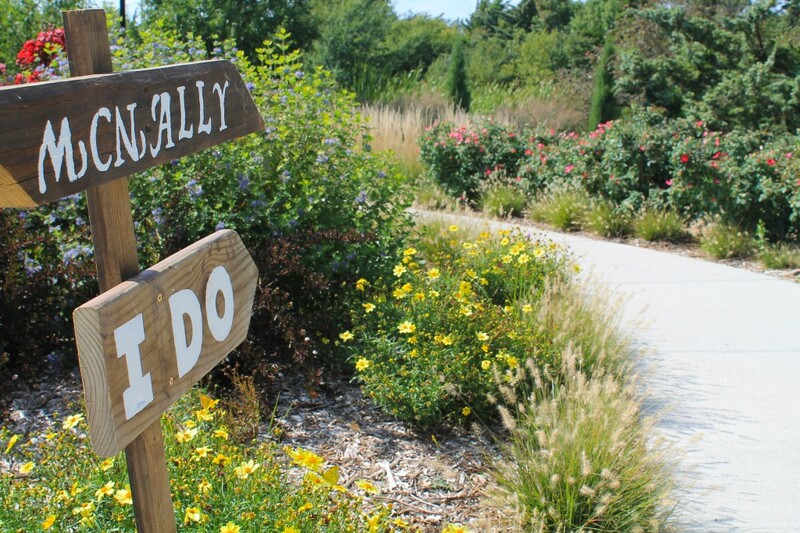 Every time I introduce a new couple to the Arboretum, I always share with them our mission, which is to promote, through education and stewardship, the conservation and use of plants native and adaptable to Kansas. In a nutshell, we are about connecting people with the prairie in every way possible. 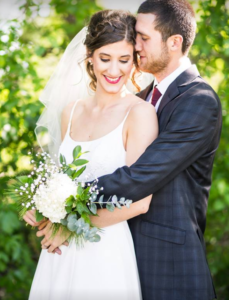 Every couple that chooses the Dyck Arboretum as their wedding venue is contributing to this mission and leaving a piece of their story with the wider Arboretum community. For that, we are exceedingly grateful. 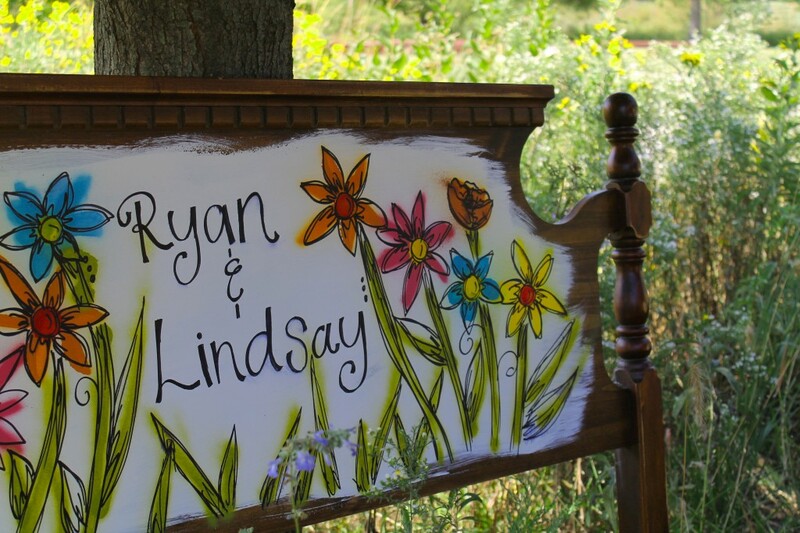 As Arboretum Rentals Manager I am privileged to work with our couples and families who choose this prairie garden as the location for their wedding celebrations. 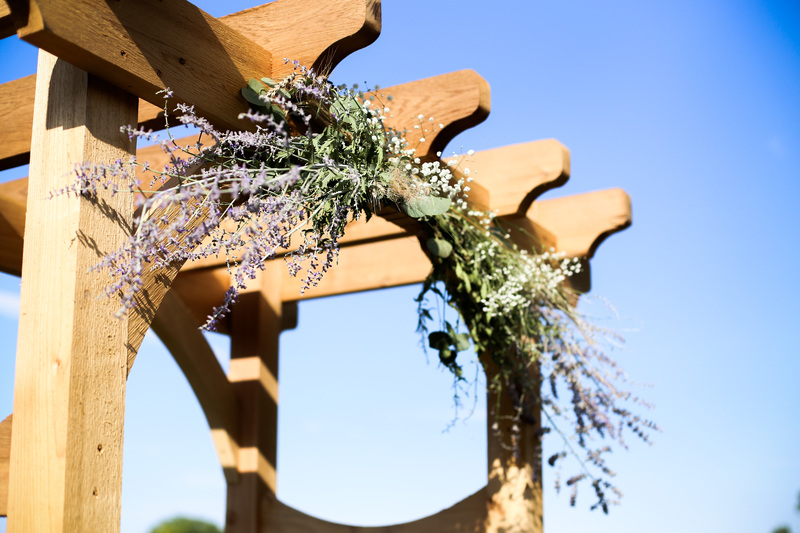 This year I have been particularly amazed at the ways in which each couple, with the help of talented friends and family members, dressed up the gardens and buildings to personalize their big day. 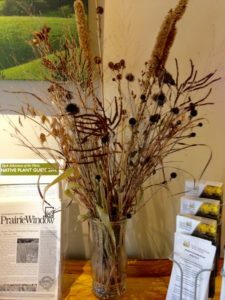 As we draw close to the end of a great year at Dyck Arboretum of the Plains, I wanted to thank all of the couples who made this prairie garden their own for a day. I also want to highlight some of my favorite ideas and decoration themes from the past year. May all of these couples and families have a wonderful holiday season, remembering the loveliness of their special day and making new memories during this wonderful time of year! 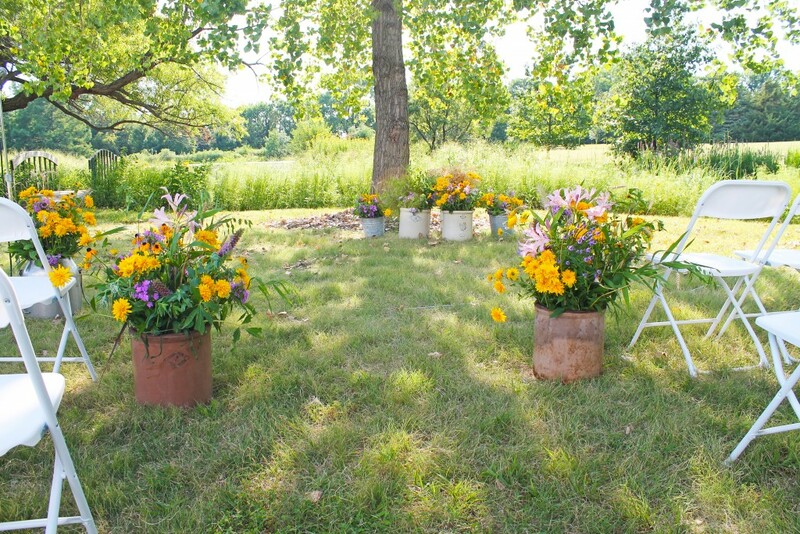 For those of you planning or dreaming of a prairie garden wedding in the future, find more ideas and photos from real weddings at Dyck Arboretum of the Plains, visit our Facebook and Pinterest pages, or take advantage of the vast wedding planning resources available at weddingwire.com and mywedding.com. 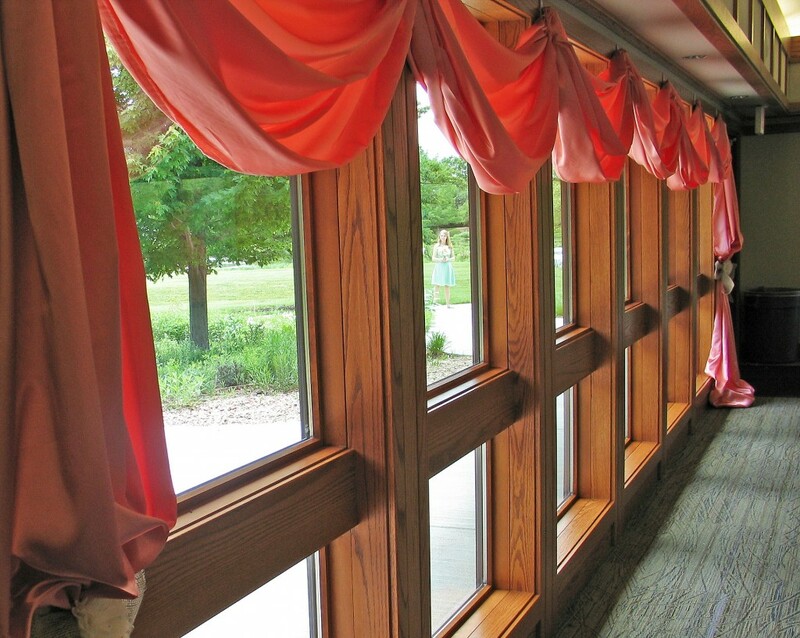 Decoration idea: Drapery hung with command strips along the full wall of windows in the Prairie Pavilion gave an elegant, at home feeling to the reception hall. Favorite vendor: Sweet B. 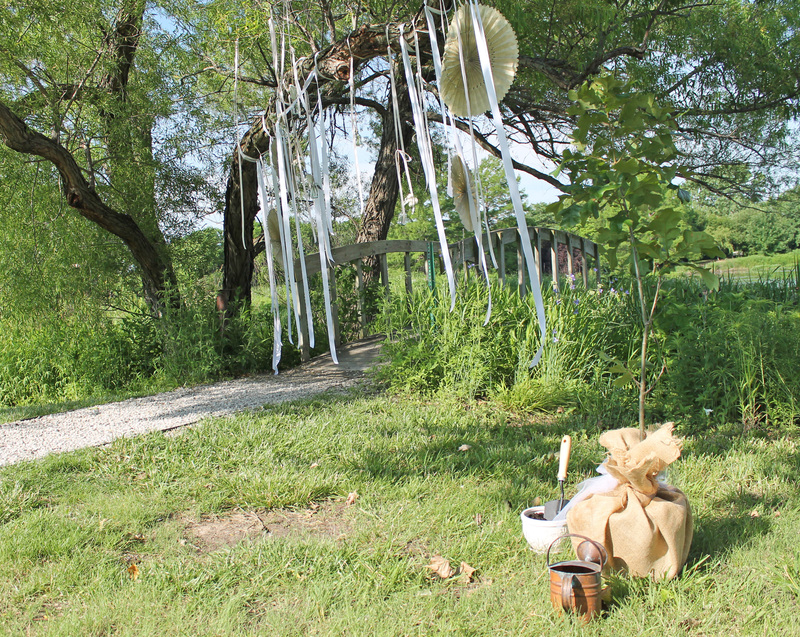 Revival out of Wichita did the flowers, including an arch hung from the willow branch at the ceremony site. We Love This Vendor! So easy to work with and her arrangements are spot on! 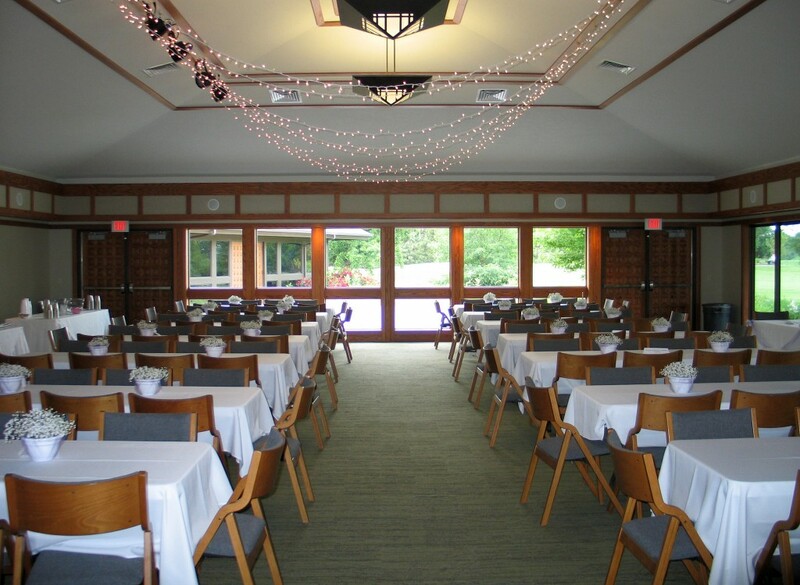 Decoration idea: Hang string lights across the center of the ceiling to create a “canopy” effect and add a little drama to the reception hall. 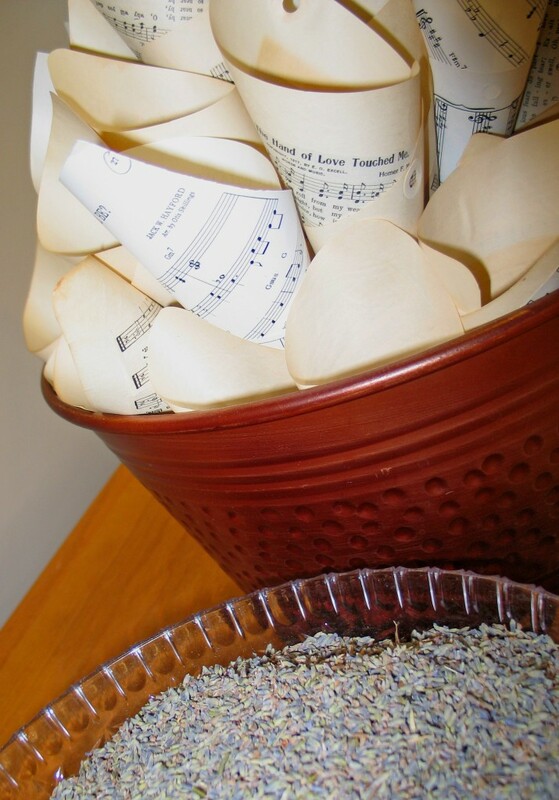 Decoration idea: Throw lavender buds instead of rice or birdseed. 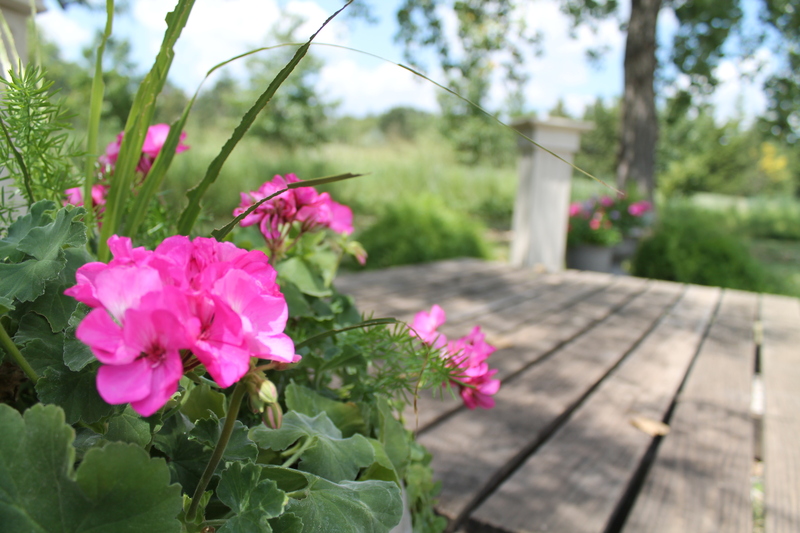 It fits perfectly with the prairie garden setting and is an organic material that requires no clean-up. 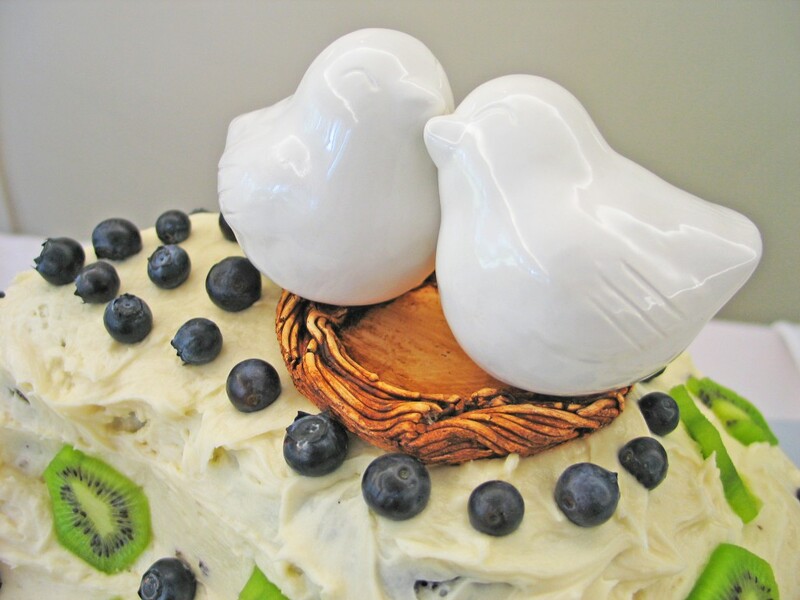 Decoration idea: This couple really chose and theme and stuck with it – birds as the cake topper, birdcage for collecting cards, feathers in the decorations and birds nests in the centerpiece displays. Favorite vendor again: Sweet B. Revival!! Decoration idea: To create an altar at the outdoor ceremony site, this couple made a platform from old pallet wood and placed potted plants on pedestals on either side of the platform. 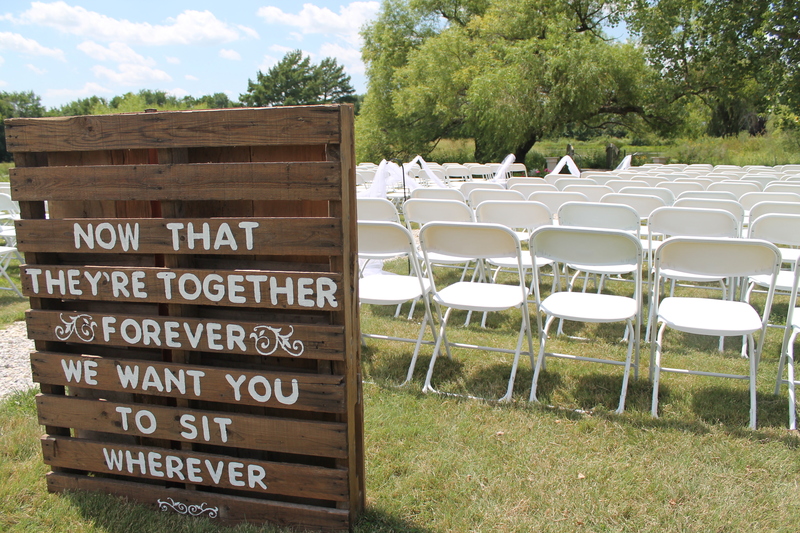 In addition, they used a pallet for a sign at the entrance to the seating area to direct guests. Highlight: This couple was also engaged at the arboretum on the previous Christmas Eve! 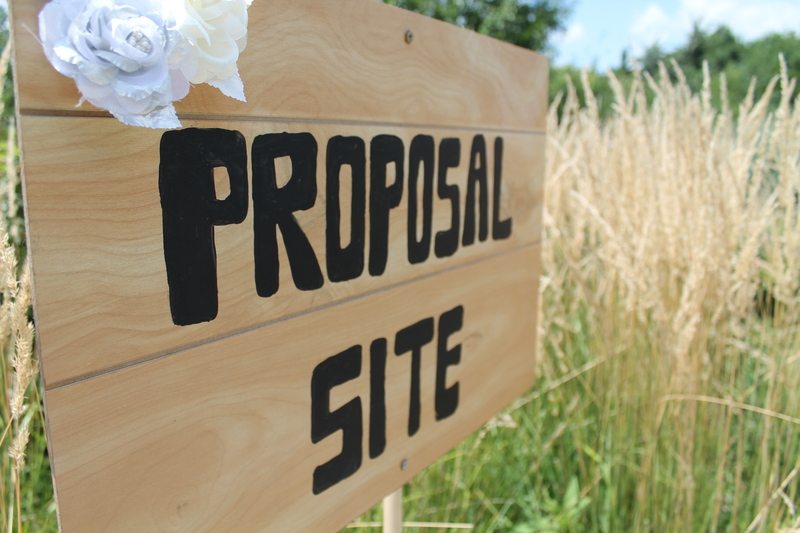 They marked the proposal site with a sign to share their story with guests. 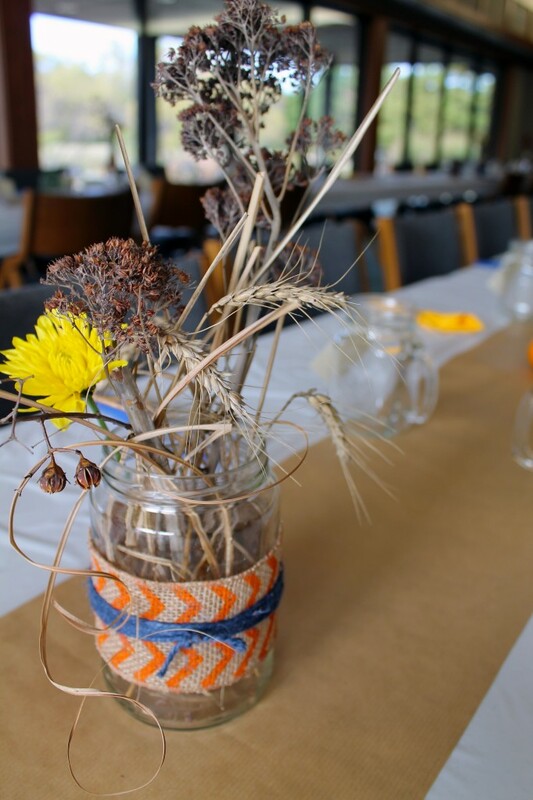 Decoration idea: We saw mason jars all year long, but they fit ESPECIALLY well with this fall wedding decoration theme, wrapped in burlap and blue raffia and filled with wheat, milo and some pops of yellow from purchased flowers. 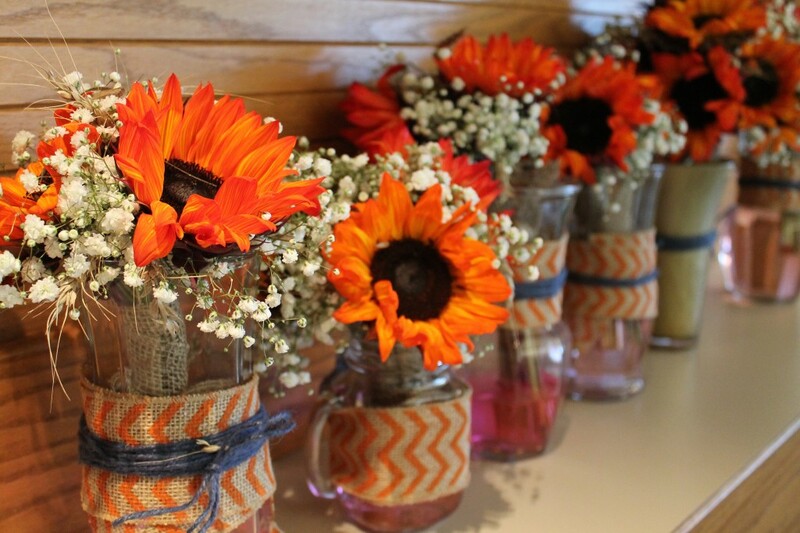 GREAT DIY centerpieces! 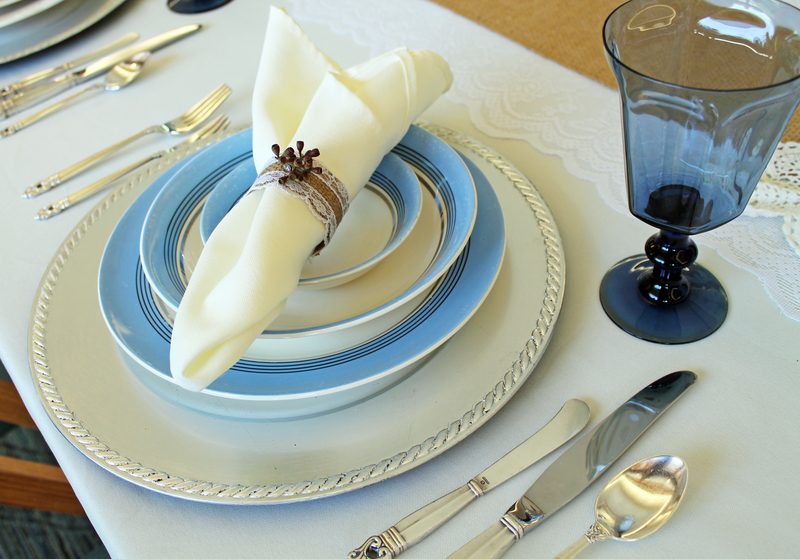 Cheers to a wonderful new year of weddings in 2015!